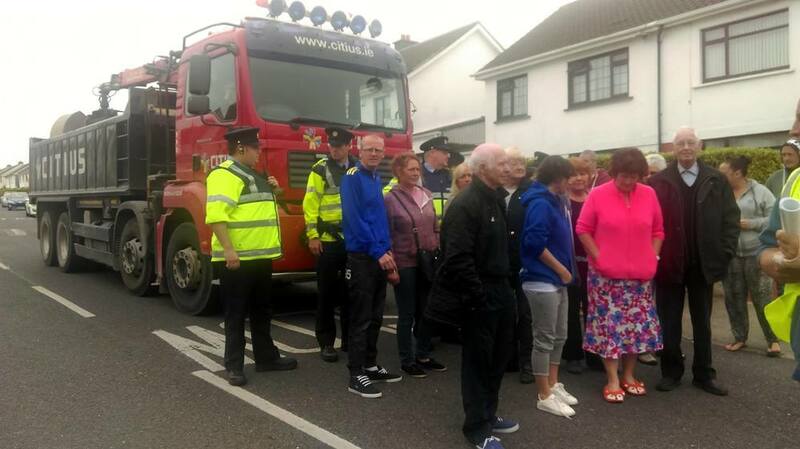 TWO ELDERLY MEN have been remanded in custody following a water charges protest in Kilcoole. Sean Doyle and Eamonn McGrath took part in a protest in Kilcoole on Monday. On Tuesday, there were tense scenes in Bray as the pair were escorted from Bray courthouse, with protesters clashing with gardaí on the main road. The two men, both in their 70s, were in front of Judge David Kennedy in Bray this morning on trespassing charges. Doyle and McGrath, who were both on crutches in court, were remanded in custody and are to appear before Cloverhill District Court on 24 May. On behalf of her clients, their solicitor requested the two men’s medications be supplied to them while in custody. The solicitor told the court there had been an issue this week with Doyle accessing his medication. It was also requested that McGrath have access to painkillers for his hip. Judge Kennedy said the two men should have access to medications deemed necessary to them. Large crowds gathered outside Bray courthouse this morning, and access to the court room was restricted. There was a heavy garda presence, with at least 18 members of the gardaí on the premises. Family members were permitted to see the two men briefly before their court appearance. Sinn Féin TD John Brady was present in court today and he is due to visit the two men in the coming days. “It is disgraceful that Sean Doyle and Eamon McGrath have been remanded in custody for protesting against water charges,” said Brady. A cross-party group of TDs have expressed concern over the imprisonment of the two men. Video footage of the protest in Kilcoole and the scenes in Bray on Tuesday were widely circulated on social media. A statement signed by Clare Daly TD, Cieran Perry, Deputy Lord Mayor, Mick Wallace TD, Eoin O’Broin TD, David Cullinane TD, Gino Kenny TD, Jonathan O’Brien TD, Thomas Pringle TD, Joan Collins TD, Richard Boyd Barrett TD, and Catherine Connolly TD, condemns the imprisonment of Doyle and McGrath. A delegation of politicians will attempt to visit the two men in the coming days. Youtube video of incident where Sean Doyle and Eamonn McGrath were arrested. As far as is known the person who is seen backing a pickup into a protester, damaging a woman's phone and pushing her violently to the ground and then attacking Sean Doyle was not arrested or charged. Gerard Kavanagh, renowned Anti Water Charge protester, shows in this video that in 2016 the resistance to water meters is alive and well. Not only that but it is peaceful yet resilient because there is a sensible agreement in place between residents and contractors. Gerard in his facebook page says "Top of Silver Heights Avenue in Mayfield. Only about I in 10 homes are accepting a meter. This crew are respecting the posters. They are even complying with the wishes of some residents who didn't want a meter or box but didn't have a poster up." 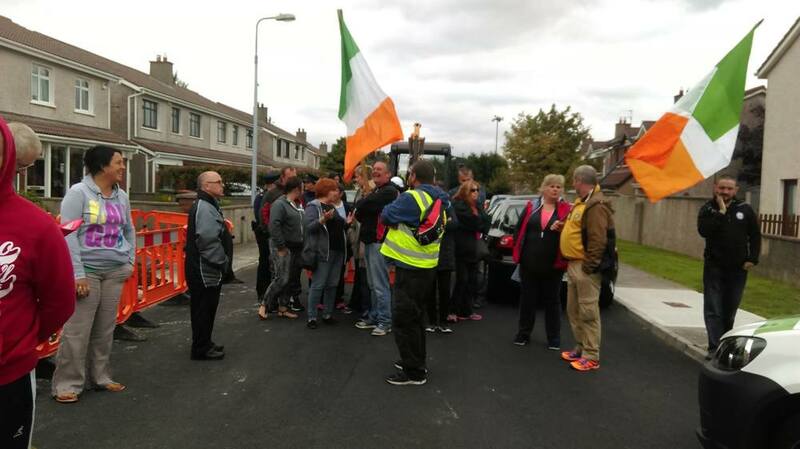 Three people have appeared in court in connection with a water charge protest in Waterford city. Derek Palmer, 22, from Cathal Brugha Place, Dungarvan, Francesa Veronica Dambra, 39, of Central Avenue, Lisduggan in Waterford city and 68-year-old Patrick Rochford from Ponds Fields, New Ross were before Waterford District Court. Mr Palmer and Ms Dambra were granted bail on their own bonds of €300, with a condition attached that neither unlawfully interfere with waterworks or related installation in Waterford city and/or county. Solicitor Hilary Delahunty, who represented all three, said Mr Rochford would not agree to undertake the same bail conditions as he said he had not actually been protesting but became embroiled in a debate with gardaí. He was given bail under other conditions. Legal aid was granted with respect to the three people and the matter was adjourned to 20 October. 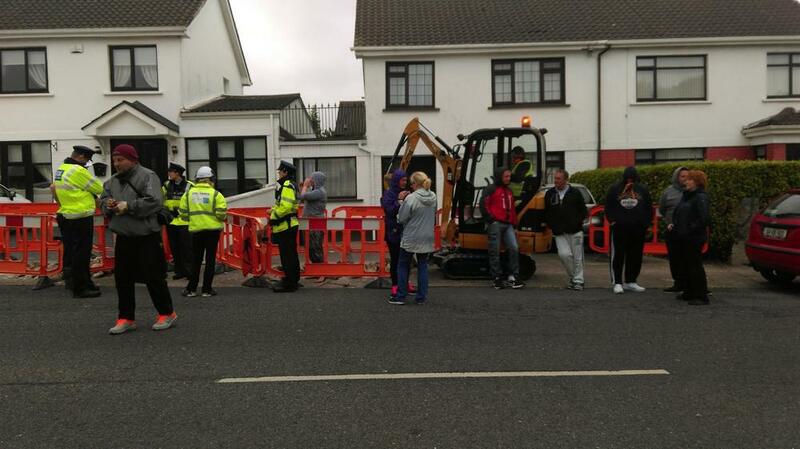 Eleven people in total were arrested this morning on public order offences as contractors from Irish Water attempt to install water metres in a housing estate in the city. The arrests took place at Laurel Park in the Cherrymount housing estate in Waterford city. Eight people were questioned at Waterford and Tramore Garda stations and files are being prepared for the Director of Public Prosecutions. Scenes from Waterford protest taken from Suzanne Ryan facebook page. "Out of the barracks now after being arrested under section 12 of the water services act.11 people in total arrested here in Waterford today.I will post pics in a few mins and you can see what IW were doing in Cherrymount.Taken to the barracks,stripsearched,fingerprinted and mugshot taken and put in a cell.One of the protestors was alone in the cell with one of the bullies..think you can probably guess who by now..this so called guard produced a knife and cut the belt from our friends trousers..this is what we're dealing with here."